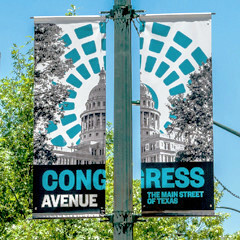 ProGraphix is a custom graphics production company that has proudly served the Austin area since 1996. Specializing in banners, posters, media backdrops, window graphics, vehicle wraps, wall murals, acrylic prints, portable displays, and much more! 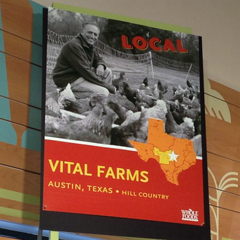 We can produce full-color posters of practically any size on a variety of materials, rigid or flexible. With the capability to run single posters or large runs, our full-color poster prints will make your creation pop. Get your business noticed with colorful window graphics. 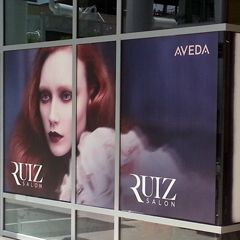 Our window graphics are a perfect solution for restaurants, retail store promotions, fitness centers, and more! 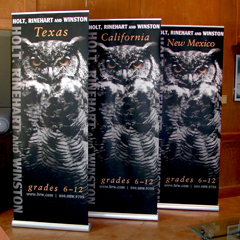 Retractable banner stands are quick and simple to set up and prominently display your brand and message. They are perfect for trade shows, media events, retail settings, and public places. Let ProGraphix combine our printing and display expertise with the service necessary to take your project from concept to completion. From banners to backdrops, window graphics to wall murals, we'll deliver what you need, on time. If you're looking for a top-quality custom wide format printer with friendly, skilled professionals, look no further. ProGraphix will work with you every step of the way as part of our unwavering commitment to exceed your expectations.